Telegraph key sales soar on eBay. On Monday, May 31st, the World Health Organization (WHO) released a report stating cell phones could cause cancer. In a related story, telegraph key sales soared. After saying that there was no link between cell phone usage and brain cancer a year ago, the World Health Organization (WHO) made a U-turn and stated that their could be a link between frequent cell phone usage and brain cancer. This international organization has created their own version of "Who's on first?" and we're not sure what's on second. I don't know is on third and looking to steal home. To avert widespread panic, WHO released cell phone usage guidelines that should help you prevent getting cancer from talking too much. Use a wired earpiece or a Bluetooth earpiece - although you should not keep the Bluetooth earpiece on your ear all the time. Don't use your phone when it has a weak signal. This causes more radiation to be emitted from the phone. When possible, use a land line instead of a cell phone. Throw your cell phone into the nearest pond, puddle, lake or ocean (I added that one - it's guaranteed to wipe out all chances of you contracting cancer from your cell phone. A brain cancer specialist on ABC Radio stated, "We haven't seen any widespread outbreaks of brain cancer, so there is no reason to fear this technology or create any panic." So, they're waiting for widespread outbreaks of brain cancer? The consumer protection agency banned side rail baby cribs after 30 deaths were caused by the deadly cribs over 10 years. 30 deaths - 10 years. But brain cancer... we'll give it some time to fester. I guess the WHO will wait until there are thousands of people with grapefruit-sized tumors protruding from their heads to say, "WHAT is that?" In the meantime, I DON'T KNOW is still on third, waiting to steal home. Already consumers are starting to panic. Today, a huge increase in sales on eBay of telegraph keys was reported. People in the U.S. are stocking up on them, just like they hoarded iodine pills after the Fukushima reactor disaster in Japan. Even though thousands of Americans are ready to instantly turn back the communications clock 150 years to protect themselves from the possibility that their head may explode, they have failed to realize that there are no telegraph lines in existence today - yet sales on eBay are ticking upwards by the hour. Even Americans that are not effected by the cancer threat are speaking out. The Mayor of Pikeville, KY, Cleburn Hastings, said, "One day we'll get those damned cell phones in this town and as soon as they arrive, we're gonna ban them." WHO reiterated that I DON'T KNOW is their third position and WTF is their second position, which they reserve the right to reverse at any time. Meanwhile, Skype is thrilled that they provide a cancer-free alternative to communications. However, once Microsoft buys them, they will fail to operate properly. In the past week, Skype reported service interruptions and conflicts with Windows and Apple operating systems in anticipation of the Microsoft takeover deal, which leaves them only available to Linux geeks at MIT and UC Berkley. For now, the World Health Organization (WHO) says that cell phones could cause cancer. And cancer specialists are stating a firm I DON'T KNOW. And the people in Pikeville, KY are still saying, "WHAT?" 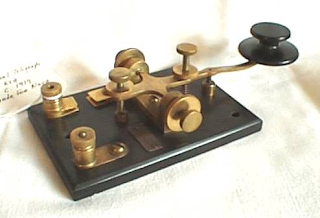 At the same time, telegraph key sales increase soared on eBay. Buy stock in STUPID, it's ready to break out to a new 52-week high.